A journey of a thousand miles begins with a single step, and the entrance into The Ultimate Fighter house starts by winning your first scrap. 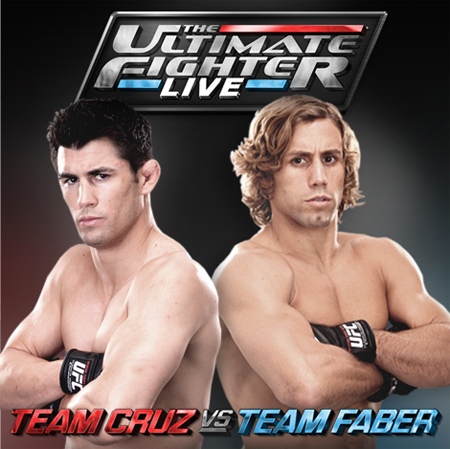 “The Ultimate Fighter: Live” premieres tonight on FX at 9PM ET/(6PM PT satellite). In Friday’s live special two-and-a-half-hour debut, 32 lightweights will battle to earn a bed inside the infamous TUF crib. The tournament winner will secure their future with the planet’s most prestigious mixed martial arts promotion by scoring a six-figure UFC contract. Opposing coaches Dominick Cruz, Urijah Faber and UFC president Dana White will arrange the 16 elimination bouts during tonight’s show. After today, the reality show will air on every Friday for the next 12 weeks live at 10PM ET/(7PM PT satellite).